Our wooden picture coffins are always a popular choice. Approved for burial and cremation and at most natural burial grounds, these are sourced from FSC-accredited companies using wood from sustainable sources. The designs are printed onto an environmentally-friendly paper wrap, which is then applied by hand to ensure the highest level of quality and craftsmanship. All Traditional Coffins come with the genuine Colourful Coffins® shoulder decorations. 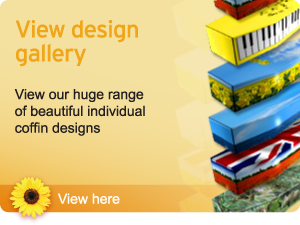 "As individual as you" is our motto, and we believe that everyone should have the opportunity to choose one of our stunning Colourful Coffins® designs in sizes to fit all; The Big and Beautiful range of wooden picture coffins provides the perfect backdrop for our range of designs.